Second Nature’s unrefined, certified organic, cold pressed flaxseed oil is produced on Drumeen family farm in Co. Kilkenny. The cultivation of Flaxseed, also known as linseed, dates back to the Stone Age. The sowing and the harvest are seen on old Egyptian mural paintings. The flax plant has wonderful blue, sometimes white blossoms. When the plant is harvested, the oil is won by pressing the small seeds slowly and gently cold pressed in a mechanical screw press. Flaxseed oil is one of the most precious and most expensive oils on the market today. 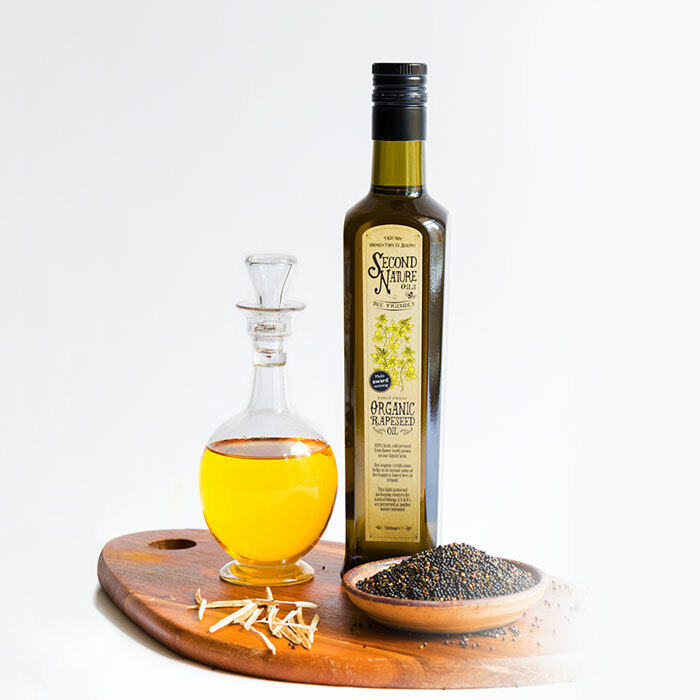 Second Nature’s unrefined, certified organic, cold pressed flaxseed oil is produced on Drumeen family farm in Co. Kilkenny, which is one of the oldest existing certified organic farms in Ireland. Flaxseed oil is well known by the health conscious & many dietitians recognise its excellent nutritional benefits. Delicious in smoothies, dressings, healthy snacks & even from the spoon as recommended by your health practitioner. It’s important not to heat Flaxseed oil so as to maintain all of the health benefits that the oil has to offer.